“But whatever the reason [for the tariff], the consequences probably won’t be severe. The solar revolution is happening so fast that the tariff will make little difference.” — Noah Smith, Bloomberg. This quote from Bloomberg is certainly true, but the immediate effect has unquestionably caused some projects that were “on the bubble” financially to be canceled, and significantly reduced the profitability of others. The uncertainty of the tariff came when the industry didn’t know the final amounts. This made financing difficult because no one knew what projects were ultimately going to cost. In reality, the module tariff turned out to be a relatively small increase of about $.15 per watt to the cost of solar projects. There are multiple ways to save more than enough money to make up for the tariff increase. Installation labor efficiencies and civil engineering work provide opportunities to increase efficiency so much so that if these levers are pulled, solar installers will be able to decrease the total cost of their projects even with the module tariff in place. 1. Reducing installation labor costs by 50 percent by assembling our systems on the ground, and then lifting completely assembled carports by crane. The cost of the crane is only about 5% of the traditional cost of labor, so the crane pays off by a lot. 2. Using standard pre-engineered array sizes and configurations. This enables us to optimize and reduce foundation count, so that our products have half the number of foundations of systems of comparable size. Not only does this reduce the overall cost of foundations, but it also reduces the overall project variability costs caused by uncertain soil conditions. 3. Leveraging local labor crews to reduce installation costs. When our customers manage the project labor or provide their own crews, they gain two big advantages. First, they eliminate markup from construction. Second, they use a skilled local crew that can install our standard systems over and over and become more efficient over time. 4. Increasing project size by covering parking spaces and drive aisles enables a system to deliver up to twice as many watts as a T-canopy. Our customers can install more watts on a project allowing them to spread fixed costs across more wattage which improves profit margins. With these cost saving efficiencies in place, developers and installers alike are certainly in a great position to continue growing the solar carport space. 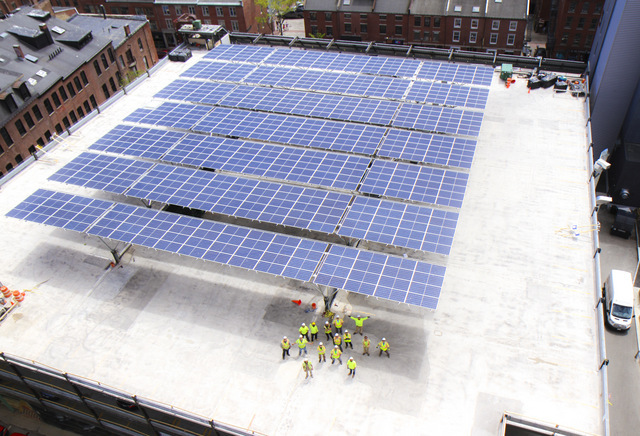 As utilities realize the unique ability of distributed generation to reduce myriad grid upgrade costs, several states are supporting solar canopy projects. Quest is seeing a lot of new projects coming to fruition in states like New Jersey, Massachusetts, and soon New York. In the coming months, Massachusetts will announce the final version of the state’s SMART Program. The current version of the program includes favorable incentives for carports. What about the steel tariff? With the module tariff proving to be manageable, albeit a little uncomfortable, now we bring focus to the steel tariff. “President Donald Trump’s foray into trade protectionism heartened a handful of manufacturers in a deeply challenged industry but upset a much larger group of thriving downstream businesses that say they will lose sales and shed employees during what should be a boom time.” — James Rainey, NBC News. Although Quest’s products are made with 100 percent American steel, the price of all steel is going up, foreign and domestic. 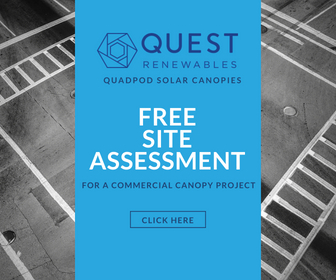 The unique design of Quest’s canopies enables Quest to help customers overcome the increased cost from the rising price of steel. Quest is partnering with customers to ensure that the industry can succeed in this environment by not raising prices on our products in response to the steel tariff. Further, foundation reduction in projects using QuadPod solar canopies will overcome the increased cost of steel. The industry is breathing a sigh of relief because the tariffs, both module and steel, have proved to be more of a speed bump and not a stop sign for project development. The bulk of the harm done by the tariffs was the difficulty to get projects financed, but financing can be found. According to the Department of Energy’s website, it remains “committed to leveraging America’s abundant solar energy resources — driving research, manufacturing and market solutions to support widespread expansion of the nation’s solar market.” Even so, the solar industry needs to remain vigilant in its’ advocacy to make sure that solar is here to stay. Finn Findley is CEO of Quest Renewables.